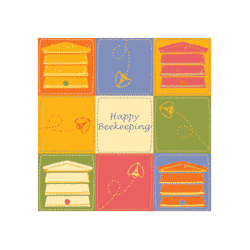 An introduction to honey bees and beekeeping with a professional beekeeper. 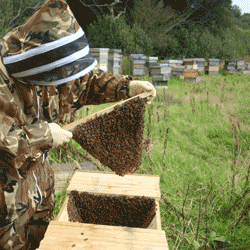 Learn how to start keeping bees or just enjoy the unique experience of discovering the hidden world of the bee hive set in the beautiful landscape of Cornwall. Bee hives and equipment will be explained as well as a practical demonstration of inspecting honey bee colonies - all you need to get started beekeeping. This is provisionally held every Saturday, 1.30 pm - 3.30 pm throughout the active beekeeping season from April to August inclusive. Naturally, this is dependent on good weather so when weather permits. The next available date will be shown below so bookmark this page and visit again for weekly updates. We post a Gift Card (included in the price) as a ticket for this course which can be used on any date. We are unable to take payment on the day. Attendees must email us to confirm before attending, we will confirm and give directions in reply. Full protective clothing is provided on loan included in the price, please notify us of your size in your email. Attendees must bring or wear their own suitable footwear (wellington boots or walking boots covering ankles). We expect this to be available Saturday 20 April, 2019.